How Much 'Turning' Is Needed to Prevent Pressure Sores? Though hospital-acquired pressure ulcers (HAPUs) are serious concerns of the health care industry, proven protocols and effective nursing practices have been known to reduce the incident rate of developing bedsores. In September 2015, Stanford Hospital in Pleasanton California announced a landmark study to prevent pressure ulcers. The study will use procedures initiated by Florence Nightingale over a century ago involving turning the patient to alleviate pressure on the skin. The study will utilize the Leaf system comprising of lightweight, small wearable sensors. The sensors will electronically monitor the position and movement of the patient and wirelessly send the collected data to mobile devices and central monitoring systems to provide caregivers instant information of the patient’s movement and position. Instant alerts will be sent by the system ensuring that every patient wearing a Leaf Sensor receives repositioning in accordance to their physician-prescribed “turning schedule.” Routine repositioning is known to reduce the incidence rate of developing bedsores. Pressure ulcers (decubitus ulcers; bedsores; pressure sores) are considered a preventable medical condition. 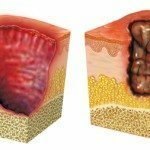 Pressure ulcers can easily develop when pressure on the skin and underlying tissues restrict blood flow to the area. This is often the result of limited mobility where sustained pressure, friction or a shearing effect damages vulnerable skin. Sustained Pressure – Hospital patients and nursing home residents often spent hours in a bed or wheelchair. However, when that time is spent in the same position, damage to the skin and underlying tissue can occur, especially on bony prominences including the back of the head, shoulders, shoulder blades, hips, sacrum, ankles, heels and toes. Friction – Resisted motion, such as the friction of dragging a leg or arm across the surface, can easily cause the development of a decubitus ulcer. In addition, the friction often makes the skin and tissue significantly more vulnerable to a serious injury where the skin tears, becomes warm or swollen to the touch. Shearing – A shearing tear or burn can occur anytime two surfaces move in opposing directions. As an example, sliding off the side of a hospital bed can cause the skin to remain in the same position while the underlying bone moves with the body in the opposing direction. This shearing motion often causes significant injury and damage to blood vessels caused by sustained pressure. The study will be conducted at Stanford Hospital in two different intensive care units in an effort to determine optimal turning parameters for every patient in an effort to prevent the development of bedsores acquired in a hospital setting. Sepsis – Blood poisoning or sepsis can develop through untreated bedsores when deadly bacteria enters the patient’s bloodstream through an open wound. Untreated sepsis is typically deadly or can cause serious organ failure. Joint and Bone Infection – A progressing decubitus ulcer can allow infection to burrow deep into the bones and joints causing septic arthritis (joint infection) where tissue and cartilage is irreparably damaged. Cellulitis – Skin infected by bedsores can cause swelling, redness and severe pain where the cellulitis can develop into life-threatening complications. What to do if Your Loved One Has Developed a Bed Sore During an Admission to a Medical Facility? The nursing home abuse attorneys at Nursing Home Law Center LLC (800) 926-7565 have represented many hospital patients and nursing home residents who have suffered facility-acquired bedsores. Our legal team serves as a legal advocate to stop the harm immediately. We accept these types of cases on contingency, so all of your legal services are provided without an upfront fee. What is ‘turning’ and why is it important to prevention of bed sores?